Before I was pregnant, this book made my reading list. I kid you not. I am not sure if it's part of my obsession with France, or my obsession with NOT being an obsessed parent. Either way, this book appeals to both of those obsessions. A little background: this book is about Pamela Druckerman, an American living in Paris with her British husband. It didn't take her long to start noticing that there was something very different about her Parisian counterparts...and like any good writer, once she got curious, it blossomed. 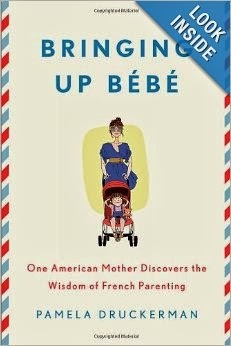 This book is the story of how she learned to strike a balance between American and French parenting with a slightly French slant. I love this book SO MUCH. I have so many great things to say about this book as an expectant parent, I almost don't know where to begin...let me start here: I'm not worried as much about getting sleep after the baby is born. That's got to be HUGE right?! I think so. Also, the French parenting methods (which the French, Druckerman is quick to say, would not consider methods) are just so sensible and so straightforward. They aren't fussy, they aren't obsessive, but they are precise and deliberate. French parents see their children as little learners and they are "educating" them from the time they are little. For instance, French children don't eat that bland rice cereal as one of their first solid foods--they eat fruits and vegetables (gee, how sensible!) and when their parents feed them, they talk to them about the food they are eating. What does it taste like, how is the texture, etc. Parents in France, unlike many American parents, also see their children as entering THEIR families...where I feel like here we see children as the CENTER of the family. This is something that my husband and I have been on the same page about from the beginning. We want to have our adult lives still, and have our child fit into our structure. It's a basic concept of letting your child know that the world does not revolve around them. Sometimes they will have to be patient, or wait, or feel disappointed. That is life, as the French would say, and I agree. Will my husband and I follow everything in the book? I doubt it, but I think it's a great place to start. This book not only gave me some great techniques, but it put my mind at ease, and that is simply priceless!!! From sleeping to eating and having autonomous lives, it seems like the French know how to build a framework that makes their children more enjoyable. French parents command respect and they do it with confidence. This is the guidebook on how to get there. I recommend this book to ANYONE who has small children or is pregnant. If you are thinking of someday having a family, log this one in your mental notes and come back to it later. You will be SO happy you did!